“Girl-rilla: The Petite Beast” is printed on American Apparel’s light weight women’s “track shirt”. Pink ink on violet. Again this is a women’s cut, please keep in mind when ordering. 25$ Tax included. 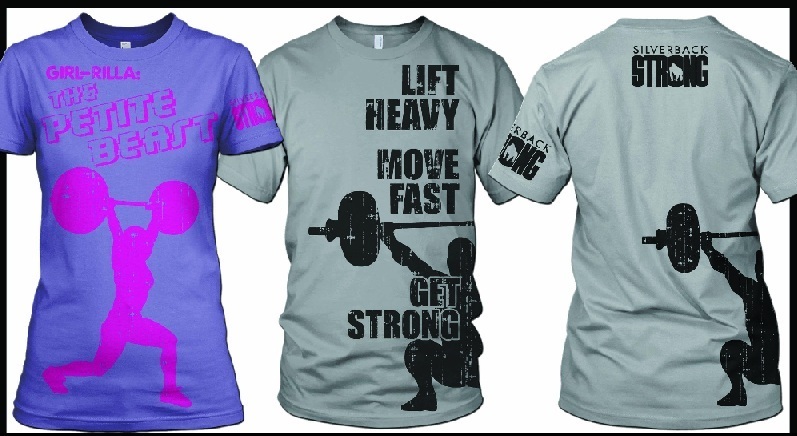 Use the contact form to tell us how many of each “Girl-rilla” or “Get Strong” and what size, up through XXL (remember “Get Strong” color as well). You will get a confirmation of your order within 24 hours (with any clarifications if necessary) payment due when the shirts come in. Orders will be open for the next 10 days, so move fast.